19.11.2007 - Despite missing several key player, Viborg showed a brilliant performance against HSV. The Germans had to be satisfied with a narrow victory that means finishing on top spot of Group E.
08.11.2007 - The Danish CL team will play an important game in the Ukraine this weekend, but their defence will not be complete after losing Grubanov. 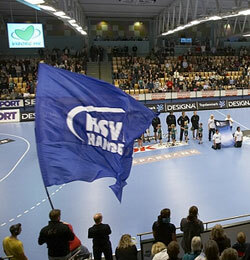 15.10.2007 - The Russians won a very important game in Denmark against Viborg. These two points may be decisive for the qualification. Aagaard: "We have to be realistic"
14.09.2007 - Danish international, Mikkel Aagaard, knows that Viborg will have a difficult CL season, but he promises to go for victory every single game.